As real railroads expanded in America the demand from hobbyists grew for scale models of the big locomotives that pulled the long lines of freight and passenger equipment across the country. Model makers started out with wood and paper trains which were followed by lithographed tin pull toys and cast iron windups and then eventually electric powered models. The scale model industry started small as men like Fred Icken, Paul Egolf, Rollin Lobaugh, Bill Walthers, Gordon Varney, Hugh Nason and Howell Day began producing and selling scale model kits. Originally called Icken-Barker Models with an address on Oritan Avenue, in Ridgefield, NJ, the Icken Model Locomotive Company, Inc. was formally established in 1927 in Harrington Park, NJ. They made custom built finely detailed 'O' scale model locomotives. These included PRR E6 Atlantics, PRR K4's, E3 Pacific's, a Ten Wheeler, a C&O 4-8-2 Mountain, a NYC Hudson, Box Cab Diesel, Box Cab Electrics and a Brill Gas Electric Motor Car. Icken also made a scale PRR X29 box car. Icken sold his models in several different ways such as in unfinished kits, finished with no detail, with the detail and not painted, painted without lettering, or completely decorated. Basically Icken could build to any specification that a customer was willing to pay for. 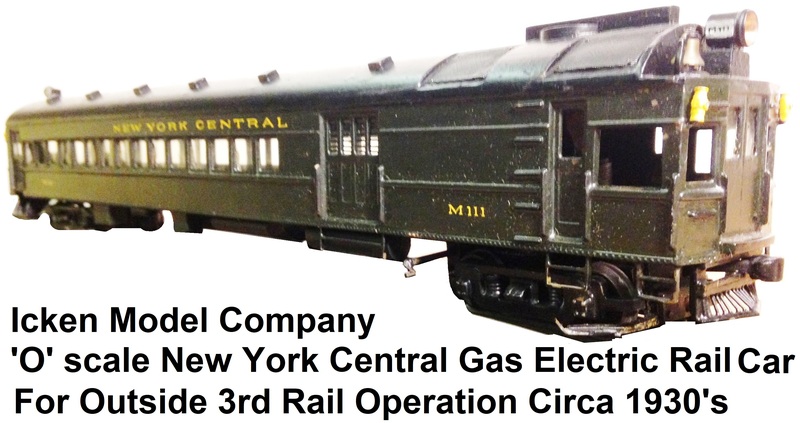 They also offered parts, motors, trucks and standard fittings for ¼" scale railroads. Fred Icken custom built his 'O' scale locomotives and tenders for customers using either his plans or the plans submitted by the customer. The company eventually moved to a second floor location at 23 Broad Ave. in Palisades Park, NJ. Another famous scale model builder, Howard Winther, worked for Fred Icken in the 1930's making the Icken 'O' scale products. 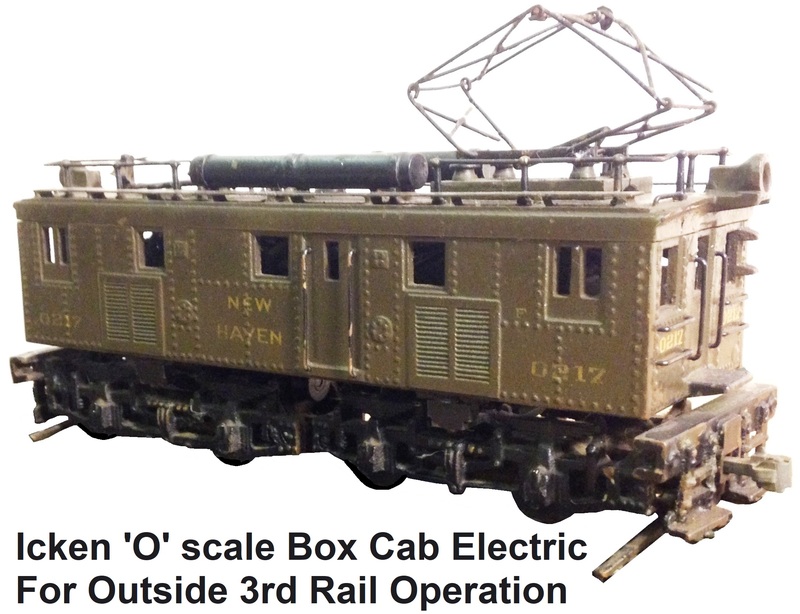 The Icken Box Cab Electric advertised in 1938 was a model of the New Haven EY-3. The model was equipped with 2 motors, was cast metal bronze and was designed for outside 3rd rail operation. It featured a reversing unit that was controlled from the top of the cab and bronze pantographs. The loco was a scale model of what was referred to as a 'Juice Engine' used for switching and in freight service 'over the road'. A complete set of castings and finished materials with finished truck parts in kit form was catalog priced at $49. A complete set of castings and materials with assembled trucks was $58, while a finished and painted model was offered for $75. Ed Alexander carried the Icken models, advertised across 6 pages in his 1937 catalog and the New Haven EY-3 box cab electric was one of the models that he was offering. Outside 3rd rail was the primary method utilized by scale modelers in the late 1920's and early 1930's for maintaining the integrity and prototype looks of their 2-rail scale layouts. The trains ran by feeding electric power to the motor in the locomotives via an elevated continuous rigid metal conductor placed alongside the rails of the track. This method was embraced by scale modelers because it was the same method utilized on many of the prototype electrified railways built in early 20th century America. The models were fitted with metal fingers called wipers or collector shoes that protruded from the sides of the locomotives or tenders and would make contact with the continuous rigid metal electric conductor feed that was typically attached to the wood track tie ends outside of the running rails that the wheel flanges rode on. Thus the term 'outside 3rd rail'. Icken also advertised a Box Cab diesel in 'O' scale in his 1938 catalog as a twin unit. These were models of the first diesel powered locomotives employed on American railroads. These types of locomotives were used for very heavy switching, such as in hump yards or on a line with heavy grades. It achieved its pulling power as a dual unit, with two complete motor trucks. Finished and painted, Icken twin motored diesels with no lettering, and a hand reverse was priced at $52. Hand lettering could be added for an extra 5¢ per letter. Icken's 'O' scale locomotives gained a reputation for being highly reliable, work horse engines. The drive unit proved to be a great choice when running trains for long, continuous hours. His locomotives logged many operating miles at the Century of Progress World's Fair in 1933 and 1934. Icken engines were expensive at the time, costing 2 to 3 times more than what other manufacturer's models cost. 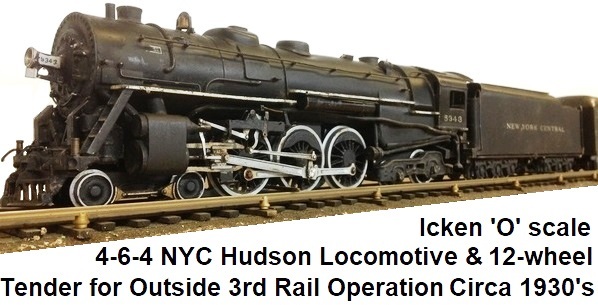 His scale NYC Hudson, like his other locos, ran using an outside 3rd rail configuration and featured a manual reverse, as well as nice hand-lettering. The loco measured 23¾" long coupler to coupler with tender and was designed to navigate 4' radius curves. The Icken P.R.R. 'O' scale K4s Pacific 4-6-2 type loco was a staple in the line for many years. Its design and construction were constantly refined over time. It was a powerful, quiet, and smooth running model. The P.R.R. actually used Icken's K4s scale model in many of its displays without alteration. Every main feature of the prototype was faithfully reproduced. It was designed to navigate 4' radius curves when scale wheel sets were used. By using slightly under scale wheels on the leading and trailing trucks the Icken K4s could navigate 3' radius curves. The loco was fitted with a #2 motor using an operating voltage of 10 - 13 volts DC, or 15 - 17 volts AC current. The reverse controller was mounted under the loco cab's floor. The standard stock K4s Pacific, complete with paint, lettering, and headlight for outside 3rd rail operation was priced at $86.50. A version of the K4s for 2-rail systems was offered for $94.50. All Icken locomotives were painted with a special semi-gloss smooth lacquer. Steam locomotive roofs and tank tops of P.R.R. models were finished in Tuscan Red. Yellow stripes were painted on passenger locomotive wheel rims as a no-cost option. Icken's Pennsylvania Gas Electric Motor car consisted of a laminated wood roof and floor with cast metal sides. The cast body components were French sand art bronze. The rail car was 19¼" long. Very few of these were made. The motor truck followed the same design utilized in Icken's 2-axle Diesel truck, but with a chain drive, and gearing that was in proportion and drove all 4 wheels. This was referred to as the #1 motor. The motor truck was installed so that it could swing enough to facilitate navigation of 3' radius curves. This truck was offered for separate sale at $3.00. The Gas Electric Motor car details included working headlight, bell, marker lamps, two pilots, and solid couplers at each end. Catalog price for a finished and painted model was $45. A reversing unit was an extra $8.00. A painted and finished model that was hand lettered, and set up for outside 3rd rail operation was priced at $48.50. One for a 2-rail system was $52.50. The most common electric motors used in 'O' scale models like Icken's, built prior to World War II, were the Kendrick and Davis (K&D) open frame universal wound field motors. Universal motors have a wound field instead of a permanent magnet and require a bridge rectifier to be wired to them to run on DC power. The bridge facilitates the locomotive direction reversing capability by changing the motor's direction of rotation when an operator throws the reverse switch on a basic DC power supply. Without use of a rectifier, the engine would only be capable of running in a single direction using DC power. In the 1930's the rectifiers were produced using Selenium. Selenium had a tendency to fail frequently, and if it began to smoke could cause health problems. Eventually Selenium was replaced by silicon rectifiers rated at least at 5 amps. The electric motor was called a universal motor because it could also be wired to run on 16 volts AC. Along with scale modelers like Ed Alexander and Bill Walthers, Fred Icken supplied engines and rolling stock for the operating layouts at the 1939 World's Fair. 8 Eastern Railroads pooled funds for the displays and the models were lettered 'Eastern Railroads' as not to show favoritism to one specific railroad. These trains were run 8-10 hours daily racking up some real mileage. The exhibit is said to have spurred the increase in popularity of model railroading among adults in the U.S. during this time period. Icken advertisements in 1940 touted that, "At least one engine on your model RR should be an Icken Engine. It will provide you with a standard of performance by which you can judge others." Fred Icken was a charter member of the National Model Railroaders Association (NMRA) and a member of the New York Society of Model Engineers (NYSME). He authored articles as a contributor to the early 1930's issues of Railroad Model Craftsman magazine and to the O Gauge Modeler magazine in the 1950's. Fred Icken was inducted into the Hobby Manufacturers Association Model Railroad Hall of Fame in 2006. The exact date that the Icken Model Company dissolved is unknown, but it is believed that Fred Icken built his scale models through the 1950's. Icken models are difficult to locate today and sometimes sell for several thousand dollars. Some Icken models are found on display at museums. The model of the Wm. Crooks 4-4-0 19th Century steam loco built by Icken Models is on display at the NY Museum of Science and Industry.